Having wowed the professionals with their Native PCM and LXP reverb plug-ins, Lexicon now turn their attention to the financially challenged! 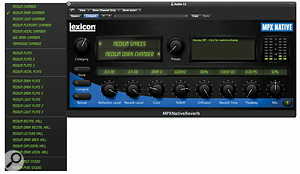 Available for VST, Audio Unit and RTAS hosts, Lexicon's MPX Native Reverb plug-in is based around the algorithms used in their popular MPX hardware series of reverb units, offering seven different reverb types and over 100 presets. It requires a second-generation iLok for security and installation, and should run under Windows 7, Vista and XP, or Mac OS X 10.5 or later on any Intel Mac. The plug-in can work in mono, mono-in/stereo-out and stereo-in/stereo-out modes. I was pleased to see a very friendly user interface, with almost all the controls needed to do the job on show on the main panel — you click the arrow to the right of the controls to see the remaining three. All the parameter values are visible, and there's a real-time visualisation meter showing the reverb spectrum, should you wish to enjoy a little extra eye candy. The seven reverb types on offer are Small Plate, Large Plate, Small Hall, Large Hall, Small Chamber, Large Chamber and Room. I was pleased to find that most of the presets provide sensible, musically useful settings rather than the familiar 'showing off but no use to anyone' variants we're often greeted by. There are no gated or reverse options here — just emulations of plates and various spaces. The eight knobs on the main page control Reflection Level, Reverb Level, 'Color' Rolloff, Diffusion, Reverb Time, Pre-delay and Mix, while the three 'hidden' controls are for Reverb Type, Reflection and Reverb Attack. Reverb Type picks one of the seven types on offer, while Reflection adjusts the number of early reflections in the reverb pattern. Reverb Attack can be lengthened to emulate the sound of reverb as heard from the rear of a performance space, or shortened to provide a front-of-room ambience. Presets are also arranged by category, which can be selected using the Category knob to the left of the panel or by the Category arrow, but to avoid cluttering the screen, when you select the preset list you see only the presets relevant to the chosen category. I found that when I opened the presets list and then moved the plug-in window, the preset list stayed where it originally opened. I don't know if this is a feature or a bug, but it does mean you can drag the plug-in away from the preset list to allow all the controls to remain visible. 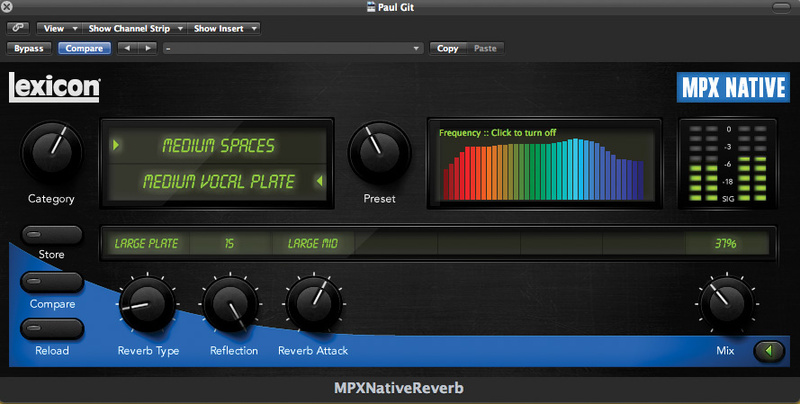 Like the Native PCM and LXP reverbs, MPX Native features an optional 'rainbow' frequency display. Sonically, the reverbs aren't as dense or mellifluous as those produced by something like a PCM96, but if you're familiar with the mid-priced MPX units, you'll know what to expect. Though a little coarser than the more up-market PCM reverbs, their slightly grainy character produces a very familiar vintage Lexicon character that sits very comfortably in a mix. Lexicon reverbs have the ability to sound like a part of the source sound, rather than a layer of reverb superimposed on top, and that makes it much easier to use reverb in a mix without eating up all the space. The separate Reflection and Reverb controls allow the early reflection level to be balanced with the reverb tail, while the diffusion can be reduced to create a deliberately more grainy reverb when needed. As you might expect, the medium spaces, such as rooms, chambers and plates, work well for routine pop work, although you can also reduce the reverb level and leave the reflections turned up to create more of an ambience effect. The smaller spaces are also useful for creating an ambience, while longer concert halls and cathedrals are included, should you need them. There are quite a few other decent algorithmic reverbs at the price, but MPX Native Reverb's big selling point is that it has the Lexicon sound. It's a significant step up from the reverbs bundled with most DAWs, and covers the standard reverb tasks very effectively. 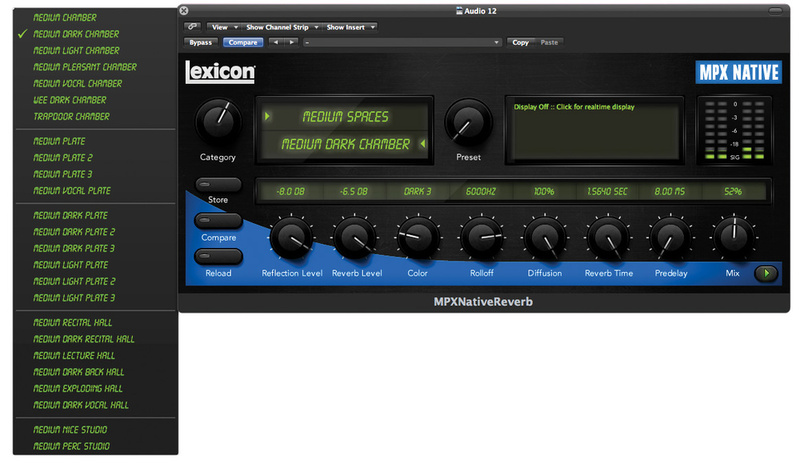 Very usable, classic Lexicon reverb treatments. 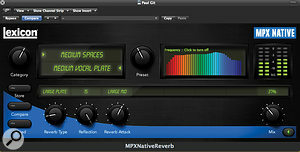 MPX Native Reverb provides high-quality reverb suitable for most pop-music applications at a much lower cost than Lexicon's high-end Native range. Lexicon Pro +1 801 568 7567.